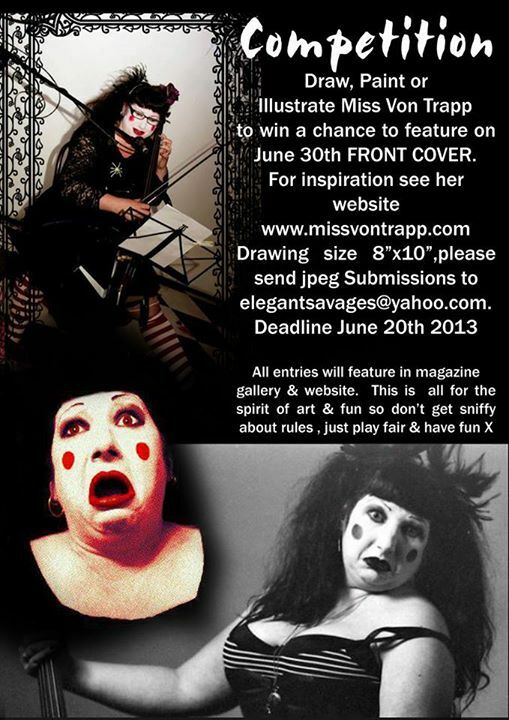 We are putting together a gallery page on http://www.elegantsavage.co.uk of ALL the submissions & the WINNER will be picked by Miss Von Trapp herself to feature on the FRONT COVER Which is good fun for all, as we have a glorious growing international following & it helps spread the good word about all your creativity!!!! So give it a go & send all entries to either the facebook page below or email elegantsavages@yahoo.com. Deadline is 20th June 2013 and size guidelines are recommended at 8" x 10" 300dpi. The usual copyrighty blurb entails, e.g if anyone nicks your images we'll display their heads on spikes outside the Tower of London JOIN IN - SPREAD THE WORD - HAVE FUN!! !